#CelebratewithDE as we return to Churchill, Manitoba, Canada for the annual polar bear migration. Since 2010, Discovery Education has teamed up with Polar Bears International to bring students a series of webcasts during the annual polar bear migration. Find out about these extraordinary animals and learn more about our favorite big white bear, its habits and more. This year we are co-hosting two events, each targeted to a specific age range, although all ages were welcome to watch. Register today and come back to this page on the day and time of your virtual field trip and we will take care of the rest! You will be able to access a live stream along with a live chat where you can meet scientists & ask questions in real time while polar bears roam outside. Looking for resources to support your viewing of these virtual experiences? Jump to the bottom of the page for associated classroom materials. Fur, teeth, claws, and fat: that’s what polar bears are made of. 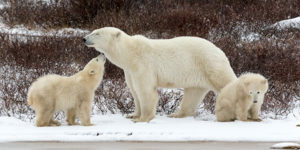 Join us to learn more about our favorite big white bear, its cubs, and the sea ice they call home. Fur, teeth, claws, and fat: that’s what polar bears are made of. Join us to learn more about our favorite big white bear, its offspring, its habits, and its place in the Arctic ecosystem it calls home. Students use images to create original presentations of new knowledge using the video Polar Bears: By the Numbers as a model. Students team up to plan and complete a narrated presentation using the instructional strategy Puppet Pictures (CND). With original illustrations or existing images from Discovery Education and Flat Nanuk as the puppet narrator, these presentations are sure to be extra cool. 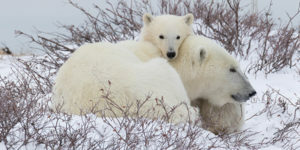 Students create survival guides for young polar bears using all they’ve learned about adaptations, the role of the mother in educating cubs, and the prey polar bears hunt and eat. Using an adaptation of the instructional strategy Half the Picture (CND), students create their guides using information about survival strategies and partial illustrations as a learning tool for cubs – and classmates. Our classroom collaborative projects use a unique, web-based educational platform, GlobalLab, to enable students, teachers, and learners of all ages to pose questions and together find answers. Enhance your experience of the Tundra Connections virtual experience by participating in our collaborative project and connect with classrooms around the world. (Grades K-8) In this collaborative global project, students explore how heat is transferred between objects, how this transfer changes matter, and why it is so important to our lives. Students learn through a hands-on experiment with different conductors and insulators. Each month we highlight key Discovery Education resources, lesson starters, webinars and live events thematically tied to special events, celebrations, or commemorations that you may be teaching in your classrooms.